The Vernal Equinox, aka “Spring Equinox,” happens on March 20th this year, but you can observe its effects a few days before or after that date. An Equinox marks the passage of the Sun across the Celestial Equator, an imaginary circle dividing the sky into north and south hemispheres, much like Earth’s geographic Equator divides the globe. The Celestial Equator runs from the West to East horizon points, tilted at an angle equal to your latitude (the angle labeled Θ in the graphic). The Ecliptic, or path of the sun, is also an imaginary circle in the sky, but it moves in a complex manner. The points where it intersects the western and eastern horizons slide north and south by an amount that depends on your latitude, and changes its tilt by ± 23½° as the seasons go through Spring, Summer, Fall, and Winter. On an Equinox, the Ecliptic coincides with the Celestial Equator. 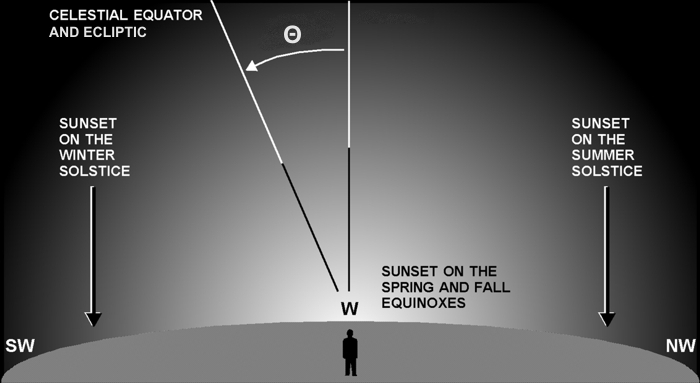 There’s also an Autumnal Equinox, aka “Fall Equinox,” in late September. On an Equinox, the Sun will set and rise exactly due west and due east. An Equinox marks the change of the seasons. Each day now, the Sun will set (and rise) farther and farther north, resulting in longer days, shorter nights, and more direct sunlight. This trend reverses on the Summer Solstice (in June), after which the Sun begins its drift back south into Fall and Winter. With the Sun now rising and setting so near east and west, rush hour commuters may notice how they are often driving directly into the Sun. Major city streets are typically aligned to cardinal directions, east-west and north-south. Traffic accident statistics show a spike at the equinoxes due to glare, so be careful out there.